This past summer I finally was able to put together a pack weight which would dip down into the “UL” status. And to be quite honest, that made me want to see if I can push the limits closer to “SUL” status. This is yet another reason I decided to give a wind jacket a try. So, when I decided I would give it a go, I narrowed it down to 3 different wind jackets. Just by looking at the list, it seems the obvious winner would be the Stoic Wraith, however, I decided against it mainly due to concerns about fit. I would have to order any of the above jackets off of the net, so trying them on first was out of the question, and it seems that the Stoic has had some issues with fit/sizing. I do have some Stoic clothing (socks and a Merino shirt) but with only one shirt, I am not so sure. Then there is the Patagonia. This wind shirt probably gets more votes from others than any of the listed 3. Just go to Backpacking Light and post about it and you will find many a happy users… This based on the fact that I love my own Patagonia items is enough to tell me that this jacket is a winner. But my hang up you ask? First off, it was the most expensive (however, any of the above mentioned jackets can be found for cheaper quite easily) but it is also the heaviest. I can get a silnylon rain jacket that only weighs 0.5 oz more than this and it is also water proof (granted not as breathable though). So, as seen from the video, I went with the size Large, simply because the jacket appeared to have a baggy fit. Most of the time, if a shirt features a baggy fit, the XL will swallow me up (see my ExO Air Strip Light shirt review for an example). And to make matters better, the size large weighs in at 2.9 oz! (For you non-mathematicians out there, that is 0.3 oz lighter than listed.) I was a bit surprised at this since usually most companies list the weight of a medium-sized item, but in this case, it is obviously not so. The first time rain fell from the sky once this jacket was here, I quickly threw it on and then went and simply walked around the yard in the rain. People thought I was nuts… 🙂 But, what I found is that what they say is true! Wind jackets are not water proof, and TNF site nails it when they mention that it is only water resistant. But don’t get me wrong here, even though I never owned a wind jacket before, I understood this aspect. As far as the actual shell, I found nothing that made me believe that water was actually passing through the material. Although, after about 5 minutes in the rain, the jacket did feel like it had wet-out and being that it is so light, it did cling to my skin. As well, this also made me feel slightly cooler too. Drying it out/off was not too difficult. After removing I gave it a few moderately hard shakes/flicks and much of the water came off. Although, since it felt like it wet out, it still held some. I draped it over the back of a chair and about an hour later when I came back around to it I found it entirely dry to the touch. This entry was posted in Clothes, Jackets and tagged 7D material, Air Srip Light Shirt, Capilene, ExOfficio, GoLite Tumalo Jacket, hard shells, Houdini, patagonia, Pertex Quantum, Stoic Wraith, SUL Backpacking, The North Face, UL Backpacking, Verto, wind jackets. Bookmark the permalink. Not really any updates, but I have been using it a lot, and really like it. I also have a Houdini, but typically finding myself reaching for the Verto more often than the Houdini. In comparison of the 2, the Houdini breathes a bit better (although, both breathes better than any rain shell I have worn), and the hood is better, however, it is heavier by 1.6 oz too. But, I have found that I personally like the slightly less breathable material the Verto is made from over the Houdini’s slightly more breathable material, and a ball cap takes care of the hood on the Verto. Then again, of course it weighs less too… So the Verto has been the winner for me. Thanks for all your insight. I’m at a point where I need to replace my puffy layer and my rain shell, and trying to put together a versatile lightweight system has got my head spinning. I’m thinking about a windshirt because my old Goretex OR Foray jacket was kind of on the heavy side and wetted out easily. So far I’ve got the Houdini, the Mont bell tachyon, and the new zpacks on my shortlist. I also saw an arcteryx that had mesh panels on the sides from the pits to waist, but I’m not sure what features (other than lightweight, hooded, with no pockets) would be considered valuable. Do you value breathability or wind/waterproofness more for the windshirt? It sounds like you and Abela rely on it to keep your down dry. Does that mean I can forgo a hard shell all together? What conditions or situations make you decide to use the windshirt vs a rain shell? Help me Obi Wan. As I mentioned, the Houdini is little more breathable than the Verto, however, I have found that I prefer the Verto to the Houdini. Admittedly, my wind jacket is taken along on all but the hottest of hikes… Around the end of May thru August is usually too hot for me to carry it here in the SE (although, there are still exceptions, which I make at the time of my hike). Anyway, I wouldn’t say that my wind jacket is a necessity, as much as it is a nicety. For this reason, low weight is a high priority for me for this piece, which is another reason my Verto wins out over my Houdini, and another reason that I noticed the ZPacks wind jacket (it’s almost another oz lighter, with the features I want). Of the ones that you have listed, my choice would be the one from ZPacks, with the Tachyon a very close second. And here’s why: The ZPacks is the lightest option, with a hood and a full zip. The Tachyon with a hood is a pullover, and while I don’t mind pullovers (both my rain shell and my down layer are anoraks), the wind shell gets used more, especially while wearing my pack, so a full zip is easier to use. As well, I like to be able to completely unzip, or zip up, my wind jacket while hiking to really get a wide range of use with the wind jacket, which means less time completely putting it on or taking it off. So, it really comes down to what features you want, and are important to you. As you notice, John prefers one without a hood, which clearly puts the Tachyon in the lead by both weight, and cost. wow has it really been three years… got an email there was activity on this post. >>> Do you value breathability or wind/waterproofness more for the windshirt? I want my windshirt to be first and foremost, a windshirt. DWR on just about any windshirt out there is so small that about all it does is give you time to put on a dedicated rain jacket. >>> It sounds like you and Abela rely on it to keep your down dry. Does that mean I can forgo a hard shell all together? By no means. DRW issue, above answer. >>> What conditions or situations make you decide to use the windshirt vs a rain shell? Ignore most of what I said in my above posts from 3+ years ago. Use a dedicated wind shirt when you need wind protection. Use a dedicated rain jacket when you need a rain jacket. The Loop on the Verto is so you can hook it to the outside of your pack, or even put it on your belt while it’s squashed up. I totally love mine, it’s great for warmer days when it just sort of drizzles a little, if you’re walking or hiking you don’t want a hard shell in that. Glad to see your review on the wind jacket, I know you mentioned it in a previous conversation of ours and I was wondering when you would be putting up a formal review on it, and as always it was a good one. Also just for kicks I checked out the Stoic Wraith and it is on sale for 48.30 all sizes, if anyone is interested in it. Yes, the price on the Stoic is very inviting. Also, keep a watch on Steep & Cheap as they sometimes have them for around $32 or $36. Anyway, thanks for checking out the post and commenting. It took me awhile to buy into the wind jacket idea but since than have become a true believer in them. For me it came down to either the “MontBell Tachyon Anorak” or the “North Face Verto” and ended up going with the Montbell, because all of my other gear is (mostly) Montbell and I did not really want a pocket on my wind jacket – especially right where my shoulder strap would be. The MB does not have a full length zipper however. I am secretly hoping that I come to the same belief, but I will see. Just curious, when do you take yours, and when you take it do you also take a hard shell? I am just having a hard time figuring out exactly when to use it…. It makes it into my pack on almost every trip out. At 2.3 ounces, why not. It is also my primary shell for my sub 2 pound summer setup. To be honest I do not have a “hard shell” anymore. Be it in Shoulder Season or in deep winter I take my standard base layer, mid layer, and than I will put on my MontBell UL Down Inner Parka (which I know we both love) and than I will put on the wind jacket to provide protection for the MBULDIP and if I am still cold after all of that, I will slip on my ZPacks CF “CloudCover” Rain Jacket (which acts as a final heat retention layer – what with CF being non-breathable and all.) The combination of those five layers gives me the ideal 5-layering system to maximize and maintain a core temperature. I am a firm believer that a 5-layer layering system, rather than a three layer layering system is a much greater approach – for those who believe in the whole layering system. There are a lot of ways you can go about it, the above five products are what has made me happy. Would be hard to get much below 10(f) degrees with it though without starting to suffer, but I have gotten down to 18(f) and been comfortable. Thanks for the info John. For some reason that makes me feel better about carrying the wind shell along with my hard shell. My layering system is similar to yours (but a little heavier). Up until now, I have used a 4 layering system. Cap 2 long sleeve base layer, R1, puffy jacket, and then my hard shell on top. The very end of last year was the first time I got to use my Montbell (I was using an inner synthetic layer from another jacket before this) and it did great when used with the other layers. I have used these 4 layers down to near single digits + wind chill. So, I will start trying to incorporate the wind jacket in with it over my Montbell and under my GoLite Tumalo. 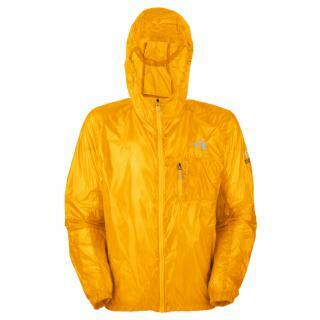 If you look at other options you might add the Montane Slipstream Quantum GL to the list – very light and no hood. If you are considering a shell that is not waterproof I think it makes sense to consider pieces without a hood – especially if you normally have a hat with you since it may be that your hat will keep you just as dry (or not dry…). Unfortunately, a hood was something that I did want on the jacket. I am still going through hats trying to find what works for me. I have been using a visor (for warmer weather) and I am not sure I like it completely. As well, if I do decide to take this with me on any of my cold weather trips I can slide it over my boggin. However, speaking of Montane, a while back I saw some super light weight wind shells that should be coming out soon, I think. I think one was sub 2 oz, without a hood though. I believe another was a smock, maybe with a hood…I cannot remember. I am going to have to go looking for them again. Anyway, thanks for stopping and commenting. I too for some reason (always) like a hood, even though it can add another 1/3rd of overall weight. Checked out those Montane in the link you provided… why oh why do these companies have to keep adding weight to gear by stupid things such as “reflective tape” and hip cordage and pockets. What is so wrong with a pure XUL jacket with no frills. Sigh. As we both discovered (me, thanks to you) by pulling the hip cordage out of our MB Parkas, there are some things that jackets just do not need.